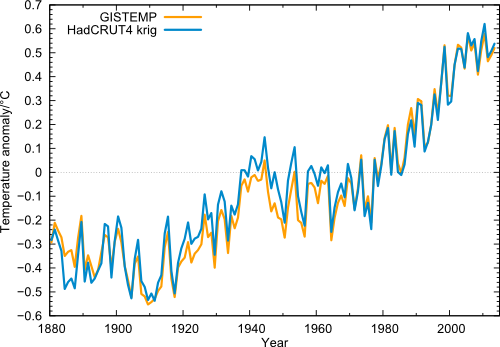 Figure 1 Global temperature (annual values) in the data from NASA GISS (orange) and from Cowtan & Way (blue), i.e. HadCRUT4 with interpolated data gaps. One can clearly see the extreme year 1998, which (thanks to the record-El Niño) stands out above the long-term trend like no other year. But even taking this outlier year as starting point, the linear trend 1998-2013 in all four data sets is positive. Also clearly visible is 2010 as the warmest year since records began, and the minima in the years 2008 and 2011/2012. But just like the peaks are getting higher, these minima are less and less deep. The recent slower warming is mainly explained by the fact that in recent years the La Niña state in the tropical Pacific prevailed, in which the eastern Pacific is cold and the ocean stores more heat (2). This is due to an increase in the trade winds that push water westward across the tropical Pacific, while in the east cold water from the depths comes to the surface (see last graph here). In addition, radiative forcing has recently increased more slowly (more on this in the analysis of Hansen et al. – definitely worth a read). NASA shows the following graphic, where you can see that the warmer years tend to be those with an El Niño in the tropical Pacific (red years), while the particularly cool years are those with La Niña (blue years). 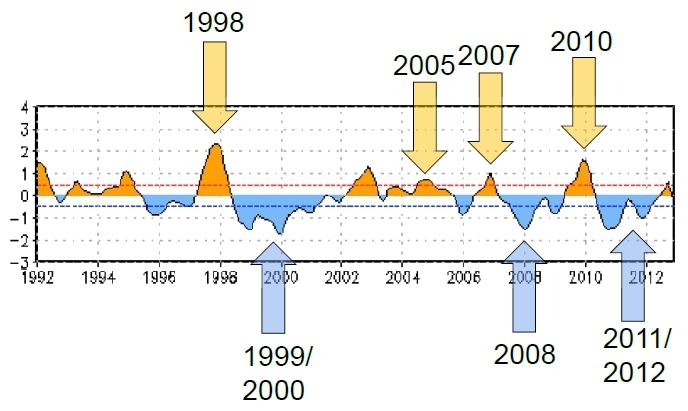 Figure 2 The GISS data, with El Niño and La Niña conditions highlighted. Neutral years like 2013 are gray. Source: NASA . How good is the interpolation into regions not regularly covered by weather stations? In any case, of course, better than simply ignoring the gaps, as the HadCRUT and NOAA data have done so far. The truly global average is important, since only it is directly related to the energy balance of our planet and thus the radiative forcing by greenhouse gases. An average over just part of the globe is not. The Arctic has been warming disproportionately in the last ten to fifteen years. Figure 3: Comparison of interpolated and non-interpolated HadCRUT4 data, as moving averages over 12 months. Source: Kevin Cowtan, University of York. Figure 4: The interpolated HadCRUT4 data (annual average) from 1970. Source: Kevin Cowtan, University of York. Following this analysis, 2013 was thus even warmer than the record El-Niño-year 1998. In all four data series of the global near-surface air temperature, the linear trend even from the extreme El Niño year 1998 is positive, i.e. shows continued warming, despite the choice of a warm outlier as the initial year. In all four data series of the global near-surface air temperature, 2010 was the warmest year on record, followed by 2005. The year 1998 is, at best, rank 3 – in the currently best data set of Cowtan & Way, 1998 is actually only ranked 7th. 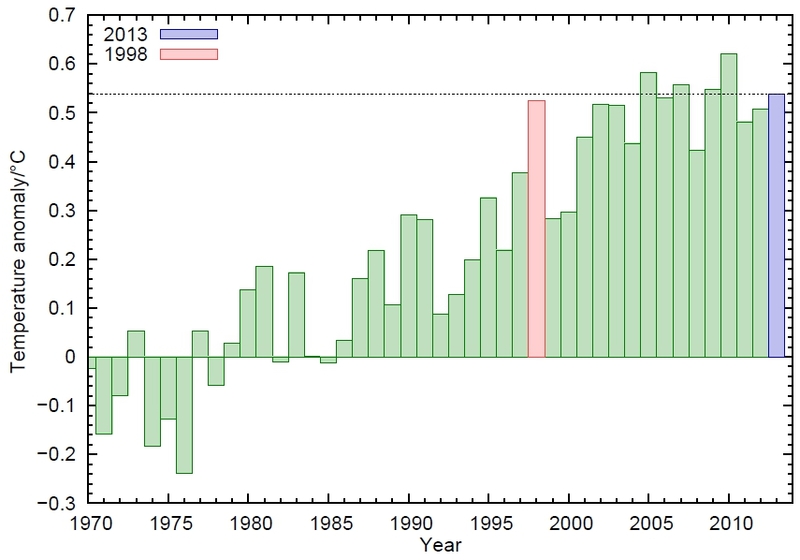 Even 2013 is – without El Niño – warmer there than 1998. The German news site Spiegel Online presents these facts under the headline Warming of the air paused for 16 years (my translation). The headline of the NASA news release, NASA Finds 2013 Sustained Long-Term Climate Warming trend, is thus completely turned on its head. This will not surprise anyone who has followed climate reporting of Der Spiegel in recent years. To the contrary – colleagues express their surprise publicly when a sensible article on the subject appears there. For years, Der Spiegel has acted as a gateway for dubious “climate skeptics” claims into the German media whilst trying to discredit top climate scientists (we’ve covered at least one example here). Do Spiegel readers know more (as their advertising goes) – more than NASA, NOAA, Hadley Centre and the World Meteorological Organization WMO together? Or are they simply being taken for a ride for political reasons? (1) In addition to the data of the near-surface temperatures, which are composed of measurements from weather stations and sea surface temperatures, there is also the microwave data from satellites, which can be used to estimate air temperatures in the troposphere in a few kilometers altitude. In the long-term climate trend since the beginning of satellite measurements in 1979, the tropospheric temperatures show a similar warming as the surface temperatures, but the short-term fluctuations in the troposphere are significantly different from those near the surface. For example, the El Niño peak in 1998 is about twice as high as in the surface data in the troposphere, see Foster and Rahmstorf 2011 . In their trend from 1998 , the two satellite series contradict each other: UAH shows +0.05 ° C per decade (a bit more than HadCRUT4), RSS shows -0.05 ° C per decade. (2) Another graphic to illustrate the change between El Niño and La Niña: the Oceanic Niño Index ONI, the standard index of NOAA to describe the seesaw in the tropical Pacific. Figure 5 The ONI index. 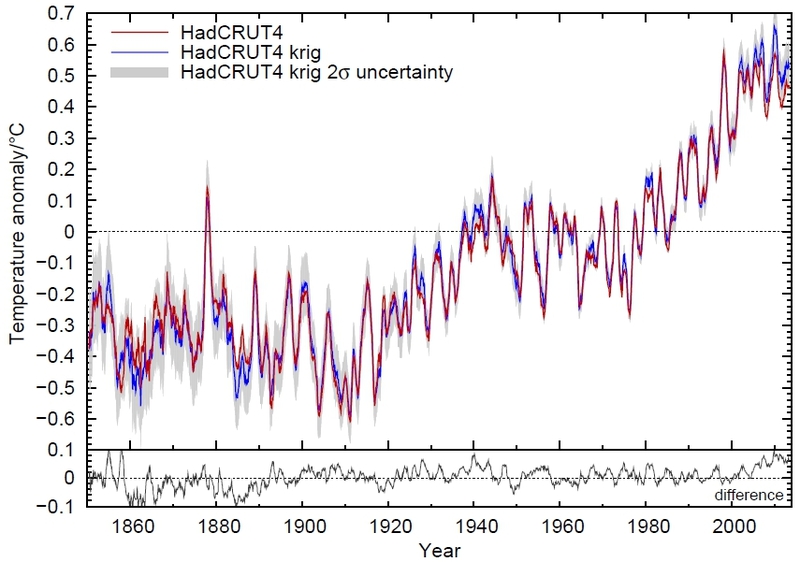 The arrows added by me point to some globally warm or cool years (compare Figure 1 or 4). Source: NOAA . Kevin Cowtan has a neat online trend calculator for all current global temperature data series. Thanks for this excellent summary of 2013’s temperature profile compared to other years. The changes in latent in sensible and latent heat flux from ocean to atmosphere that occur during El Nino (greater flux) and La Nina (lower flux) are of course key to understanding the short term variability in tropospheric temperatures. In terms of the so-called “pause”, it becomes more and more clear that the current cool phase of the PDO is largely responsible for this “pause”, but looking at the continued rise in ocean heat content, and the nice job Cowtan & Way have done interpolated Arctic temperatures, we see that the “pause”, may have reflected a slowdown in the rise of tropospheric temperatures, but the energy imbalance of the climate system continues quite strongly. Furthermore, the next large El Nino event will very likely bring new record highs to global temperatures, perhaps breaking those records as strongly as Australia’s regional records were shattered in 2013. Within reason, a heat deficit in the ocean is made up by a larger transfer of energy from ocean to land, which has the side-effect of producing amplification of land warming. Agree also with you on the nature of the pause. Thanks for putting Cowtan & Way into the big picture. SPIEGEL is on record for fabricating negative renewable energy articles under Stefan Aust. (1) It appears that some of the journalist hired under him can still market their ideas of what climate change is. Though not all articles on climate are bad, but the importance is clearly lacking and as noted many articles have a lot of motivated framing and spin to it. On top of this you have the regular deniers who in a timely manner prevent any honest science discussion. The moderation sometimes even promotes denier comments is my impression, when blocking links and arguments to scientific data. To me it is bad news if PDO is the main antagonist of the hiatus. I say that because “sceptics” will have years of ammunition pointing out their view of what AGW means, that is surface temperatures. Of course government all over the world will do anything to delay any real action and they could have another 10-20 years to do just that. When the warming eventually comes back, logical it should be in the likes we never seen before and then it will probably be to late. I really don’t like what I see. I think Australia has been getting a taste of that. It is also interesting to note the relationship between Australias warmth and the record OHC in the Indo Pacific Warm Pool. We often see “skeptics” suggest that the additional warming stored in the ocean can’t possibly come back to affect tropospheric temperatures in any meaningful way, but the record levels of energy being stored in the Indo Pacific Warm Pool has impacted and made possible the record tropospheric temperatures Australia saw in 2013. Thanks for this excellent summary. I guess “krig” (Figures 1&3) should be “krige” (after the late Danie); hence “kriging” (usual spelling) rather than “krigging”. Example: where I currently live, we have undergone a recent series of temperature swings over the course of the last 4 weeks with highs in the 50’s (farenheit) and lows near -15 (farenheit)… that’s happened several times. It seems to me that ~60 degrees (F) temperature changes in Northern North America in January is a bit… off. But one season does not a trend make… has anyone done such an analysis of differences over time and space? However – if you’re looking into the comment sections of those DER SPIEGEL articles, there are quite a few brave souls stemming the tide of fake “skeptics”. Quite successfully so, in recent months. Does this replace gavin’s yearly “How well are the climate models doing?” or do we have that to look forward to as well? Daniel Curewitz – The GISS tool allows you to make trend and anomaly maps for months and seasons. However, these are monthly averages. It sounds like you’re interested in changes in monthly or seasonal extremes (highs and lows). For that you’d need to start with daily temperature records: your best bet is probably your state or city weather service. Steven Goddard has apparently uncovered massive “discrepancies” in the US temperature record, he has a post called “Just Hit The NOAA Motherlode”. Now considering his past skills I don’t doubt he has made a massive mistake somewhere. Does anyone know of any good analysis on the real situation? I have been seeing several papers recently about China aerosols affecting North Pacific weather, and pollution on the US west coast. Is there anything new on how they might be affecting the energy balance? 1) It is not correct to say that there are “no permanent weather stations in the Arctic”. What you mean is that there are no permanent weather stations over the Arctic Ocean. 2) The Arctic Ocean buoy data are not “intermittent”. Since 1979, we have had a network of buoys that drift with the sea ice cover. As old ones die, they are replaced by new ones. Where can we find more recent data from Arctic buoys? What are the 95% confidence intervals of the point estimates of average temperature? It seems to me bad practice to discuss the latter without the former. The USA temperature record is at most 2% of the area of the world. So I would discredit Goddard just for his sensationalism. Based on my “climate-geek” analysis of the temperature records, the GISS (NASA) and NCDC (NOAA) records appear to be much higher quality than the HadCrut records. For example, when I try to fit natural variability models to HadCrut data, various abrupt shifts appear in the residual that look to me as artificial. In contrast, the only interval in the GISS or NCDC global time series that looks odd is during the WWII years between 1941 and 1945, where it appears that all the temperatures have a warming bias of 0.1 C. I agree with J.J.Kennedy that it is an artificial shift based on war-time procedures, but I think the corrections that Hadley made post-WWII were questionable. Best to use the GISS or NCDC data. As an ordinary physicist (no climate expertise) I have always noticed the “hump” in Fig 1. around the 1940s relative to a very broadly-brushed exponential curve fitted to the 1890-present data. I must have missed comment on this anomaly – if it is such – so would someone enlighten me, please? Surely not WW2? MightyDrunken @12 refers not to global temperatures but to Goddard’s latest attempt to unravel the warming trend in USHCN v2 (which I note has been pasted around the deny-o-shphere over the last few days). So it is slightly off topic. Do bear in mind that Goddard has already been round the block on his attempted unraveling of USHCN v2 (for instance). Indeed his unraveling hasn’t been very productive even when he did spotted a problem. His latest effort is rather more incoherent with its accusations all over the place. Perhaps that’s the strategy – if you don’t explain what you’re going on about, there is less risk of making yourself look stupid. However I would say of the USHCN v1 to v2 update that it is badly explained (eg here) and given the impact of the new version, a clearer explanation would be a welcome development. But with even the Version 1 explanation not as clearly described as it could be, explaining the Version 2, the changes from Version 1 and the controversy leveled at it – all this may be too much for one simple account. Tamino has looked at this and much of the explanation lies in decreased volcanism, increased solar activity and greenhouse gasses during that period. That and natural variability. Re jaget80’s comment (#4) on the PDO. If global surface temperatures continue not to increase v quickly over the next decade or two then I think this could seriously slow down action to cut GHG emissions, no matter how well understood the “slow-down” is, and no matter how much additional heat is measured accumulatng in the oceans. Forgive my ignorance about the PDO. Is there any reason to believe that the PDO is likely to exert a strong surface-cooling influence for a decade or two to come? I’ve heard it said that ENSO can essentially be treated as random and is not predictable except over v short timescales. Is the PDO itself predictable? One idea is that this is related to PDO and how slight changes in the earth’s rotation rate can set in motion large-scale upwellings in the ocean that reverse as the rotation accelerates and decelerates. I include the LOD in my CSALT model of temperature variability and it works effectively to compensate for the temperature variability given approximately a 5 year lag. So the 1940 hump (not the spike between 1941 and 1945) is thus right around the time that the LOD data indicated that the earth was decelerating to its maximum rotation rate. This may have a +/- 0.1C impact on temperatures for the LOD swings we see, which pales in comparison to the +0.9C warming that has occurred due to CO2 accumulation in the atmosphere. BTW, the LOD has also been identified by Judith Curry as one of the “Stadium Wave” proxies in her own theory of climate variability. Re David Beach @19, it’s not so much the 1940s “hump” as the 1950s-60s-70s “trough.” The reason for the trough is thought to be the surge in aerosols generated by the post-war economic boom, finally removed in the late 1970s by the implementation of the Clean Air Act and similar legislation in Europe, thereby unmasking the steadily rising CO2 forcing that had been there all along. period when the coupling between the modes is not increasing. So where are these changes in direction of the GMT/SAT? Except one, they are in very close proximity to where the PDO changes direction. 1950-1970s through is for transition from mostly coal (larger aerosols that fall out quickly) to mostly oil based economy and post war economic boom (smaller aerosols, more sulfates), as far as I know it. The big question for the future could be, if China and India start to clean up their energy production, how will the temperatures and the monsoons respond. Will they get droughts similar to US south on their agricultural areas. Dan C. @8 How big the temperature fluctuations normally get in January depend very strongly on your location. The fluctuations you describe, from about 50F to -15F, would be an approximate fit for interior New England or central Iowa. In either case, it would depend on the storm track, which has been exceptionally stable this month, due to the blocking pattern in the eastern Pacific and downstream vortex over Hudson Bay. The storm track puts you in alternating mild and very cold air, and it’s been happening frequently. I don’t mean it wasn’t due to a combination of things–but to focus thoughts about aerosols in the post-war boom, described nicely @ 26. The more we fly the more we mask our climate debt, so to speak. If I am not mistaken. Not sure I follow you here. IIRC, it is dimming from aerosols that is most likely and quickly to shift monsoonal patterns in India and the Sahel in such a way to potentially cause massive disruptions in food availability. Are you saying that the loss of these aerosol injections will create such as large, sudden increase in GW that they will get the same kind of disruptions in rain patterns anyway? Recent work has suggested that the ‘shielding’ effect of aerosols is probably a bit less than once thought (again, if memory serves). 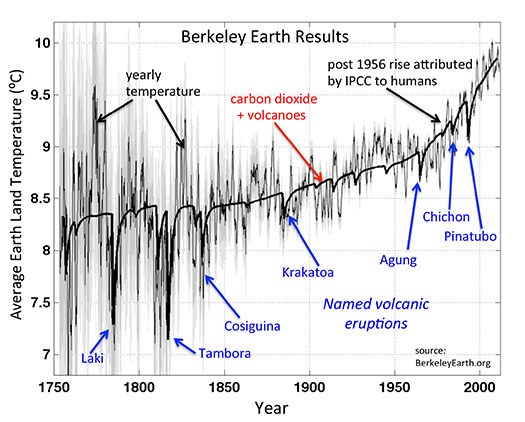 I’ve finally posted the CO2 time series data on my web site. I have figures for 1832-1958 from the Law Dome ice cores, and 1959-2012 from Mauna Loa air flask sampling. Are you sure you don’t want to rephrase this, “Although there are no permanent weather stations in the Arctic”? To my mind the Arctic is anything north of 66.5 and there are many permanent weather stations within the region. Perhaps you meant the Arctic Ocean basin? #32 BPL: Thank you very much. My climate literacy is spiking. I like the long TSI series, both of them, and the charts. Many thanks for the multiple replies to my query @19. I can best relate to Jim Eager’s note @26. I had direct experience of industrial pollution in England 1956-1975, which was as bad as today’s Chinese examples. From what I remeber airplane contrails have a small net warming effect. They have a noticable effect on the diurnal variation (day/night difference), by blocking some sunlight, and also blocking some outgoing longwave radiation. The former effect cools daytime temps, while the later warms nighttime temps. #36 Thomas: Thank you. Your comment is helpful to me. I deliberately avoided the word, “contrails.” But it does appear in what I linked. I was thinking about smaller aircraft too. I should re-phrase my comment to include everything we burn, however we burn it, to whatever purpose. I am thinking about the moral hazard of masking our climate debt. I know that assessing it is really complicated. If you bring in Cowtan and Way, you also move the point “since records began” from the 19th century to 1979, and you lose the big picture. I really like this blog and respect the contributors. I find it frustrating though that discussions of global warming continue to be based almost exclusively on the traditional station-based data set. The anomaly maps produced by GISS/NCDC/Hadley Centre are full of holes. Cowtan & Way tried to fill one of those gaps using in-situ observations and traditional methods, and everyone gets excited. The satellite data record is consigned to a mere footnote, and reanalysis is not even mentioned. Come on people: We have learned, during the last few decades, how to utilise satellite observations in combination with other observations and (very good) models. Trend estimates from the latest reanalyses agree with those based on station data within the accepted uncertainties of those estimates. They also provide real information globally. Nothing is perfect, but you need to start discussing them. My caution is — read the citing papers, when someone hands you a reference. Follow the idea forward in time. “It’s a poor sort of memory that only works backwards” as the White Queen said to Alice. The contrails are a distinct issue: combustion products including H20 added directly to the usually dry stratosphere. While I agree that the satellite series are useful tools and could be exploited with greater frequency, they are not without problems. For one thing, they are not measuring temperature, and not even measuring a surface temperature proxy, but rather a tropospheric temperature. Second–and not unrelated–these series are far more likely to be distorted by large response to ENSO variability. No, none of these issues is a insurmountable, let alone a disqualification, but these are issues that need to at least be fully understood if not solved. Stefan, thanks for this post. The graphics and links are eloquent. Fig.2 directly rivets my attention. Links on Figs. 2 & 5 are great updating resources. The ONI background presentation (link) is something anyone who’s interested can understand. If the net forcing increased for several decades, then leveled off 15-20 years ago, wouldn’t that cause the rate of warming to level off too, not to slow down? Some commentators above have mentioned the PDO in relation to the ‘pause’. Whether it is the PDO, or another natural oscillation (my money’s on the AMO), which is holding global temperatures more or less constant its significance is not just as a weapon for sceptics in the future. If, in its negative mode, it can fully counteract anthropogenic warming then in its positive mode it made a large contribution to warming in the last decades of the previous century. To what extent was this taken account of in climate model calibration? A decreasing growth *rate*–“the growth rate of the net climate forcing has been slower”–still implies an increasing net forcing. It’s just not increasing quite as fast. Finally I bring up the often derided 60 year natural signal which appears to modify GHG warming. It’s right on schedule to have its cooling phase counteract GHG warming (and any warming due to solar activity which is now near its maximum but not showing in the record). All of this does not contradict GHG warming, but it does point to climate sensitivity being on the low side of the IPCC’s estimate and as such calls into question the higher climate sensitivity of current climate models. In short the past decade presents climate scientists both observational and modeler with more challenges that we thought we’d have in the year 2,000. Chick Keller, a major reason RSS deviates so much may well be its poor coverage of the Arctic (and Antarctic). As shown in Cowtan & Way, leaving out the Arctic has a significant influence on the trend for HADcrut. When I see folks advocating RSS without mention of any other dataset or the fact that RSS is inconsistent with any other dataset, my spider sense starts tingling, and I wonder if I’m dealing with someone wearing blinders. As a layman, what I see is a constant emission of 35 billion tons of CO2 each year, and a 43% increase of ppm in the atmosphere since the industrial revolution. That is a destructive course, and the prospects for reversing seem grim.